Most Indian soldiers were volunteers who could not read or write before they were recruited by the British but serving in a professional army provided opportunities to acquire new skills. Here Oliver Vanden Eynde writes about his research which suggests higher post-war literacy rates in heavily recruited areas can be attributed to informal learning opportunities in the army. The contribution of the Indian Army to WWI is often overlooked, but there is probably no better illustration of World War I’s global dimension than the sacrifices and victims in the colonial armies. Raw figures help to appreciate the enormous scale of India’s war-time recruitment: the subcontinent sent almost 1 million men to front lines across the world to fight the Central Powers. 138,000 Indian men were sent to France, 675,000 to Mesopotamia, and 144,000 to Egypt. 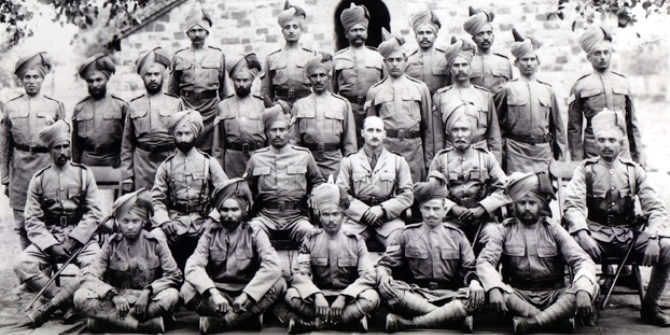 It is easy to understand why the British Government of the time was keen to rely on the Indian Army: colonial India was home to more than 300 million people in 1911 and a formidable source of potential recruits. Yet there were vast differences in regional recruitment patterns. In 1918, more than 400,000 troops (roughly 40% of the Indian army) came from one province that accounted for less than 8% of the Indian population: Punjab. Colonial Punjab (and its Princely States) comprised the present-day “Punjab” states in Pakistan and India, as well as the states of Himachal Pradesh and Haryana in India. While the province had always been a preferred recruitment area, the onset of the Great War suddenly and massively increased demand for military forces: the total number of men recruited from Punjab increased by more than 500% between 1914 and 1918. Even within Punjab, geographical recruitment patterns were far from uniform. In Rawalpindi, more than 30% of the eligible male population enrolled in the Indian Army. In Karnal, in contrast, less than 5% of the male population of military age was enlisted. These inequalities become even more pronounced when we look at religious communities: casualty rates indicate that the recruitment ratio for Hindu and Sikh men in Rawalpindi was only one third of the recruitment ratio of Muslim men. What happens if more than 30% of working age men are suddenly recruited in the army and sent on military campaigns far from home? A rich historical literature has documented how the experience of serving in the army transformed both soldiers and their home communities. Death, illness, injury, and psychological trauma were clearly risks that shaped the war experience of Indian soldiers. But, for a subset of soldiers, serving in a professional army provided opportunities to acquire new skills or to gain higher wages. Most Indian soldiers were volunteers recruited from small rural villages and could not read or write before they joined the army. Still, the 1931 Census report suggests that a set of districts in Punjab “owe the increase in literacy to the return home of demobilised soldiers, who very often pick up reading and writing in Roman or any other of the vernaculars in the course of their military career” (Khan, 1932). In my research, I used information from census records to estimate the impact of military recruitment during the First World War in Punjab on the literacy rates. I estimate recruitment patterns in the religious communities of each Punjabi district based on casualty records of more than 19,000 soldiers that are maintained by the Commonwealth War Graves Commission. The detailed information in these records on the name of the victim and of his father enabled me to identify the religious group of each soldier and the district in which he was born. I use the strong variation in religion-specific regional recruitment rates to assess whether military service can explain changes in literacy after the war. The analysis confirms that, between 1911 and 1921, literacy rates (as well as the number of literate individuals) increased significantly in heavily recruited communities. This effect is strongest for men of military age, which is consistent with the hypothesis that soldiers learned to read and write on their foreign campaigns. My estimations suggest that for every ten additional soldiers recruited from a community, the number of literates in the community on average increased by three individuals after the war. These effects are large given the underinvestment in public education at the time. Possibly, military service provided an environment in which the personal returns to education (including the ability to communicate with one’s family) were increased. Historical sources also point at the distribution of reading materials among the soldiers to boost morale. Therefore, the costs of acquiring literacy skills could have reduced while soldiers were in service. Family members could actually have benefited from a similar mechanism: it is possible that those who stayed in India also acquired literacy skills informally, as they were dependent on newspapers and letters for news on their loved ones on foreign missions. Nevertheless, the size of the estimates (which suggest that the number of additional literates was smaller than the number of recruits) and the absence of improvements in child literacy seem most consistent with an informal learning mechanism that is strongest for serving soldiers. It is not obvious that differences in literacy outcomes between heavily and lightly recruited communities are causally related to military service. British recruiters could have favoured communities with favourable literacy development prospects, or more ambitious groups could have volunteered in larger numbers to participate in the war, but I found no evidence of such targeted recruitment or skill-based selection. In fact, there are few observable differences between heavily and lightly recruited communities. The geographical distribution of World War I recruits, while incomparable in overall magnitude, strongly mimicked the pre-war geographical distribution of recruits. These patterns had developed over many years, and reflected demand constraints by the British administration. Worried about the quality of recruits, official “recruitment handbooks” identified “fruitful recruitment grounds”. These handbooks offer insight in the multitude of selection criteria that officers applied to determine whether a religious community from a specific region (tehsil) could provide good recruits. These often prejudiced and racist criteria bear no relationship to conditions that are favourable to literacy development, probably even to the contrary. These contextual factors offer support for an analysis that attributes different literacy outcomes before and after the war to military service. Clearly, war-time military service is no substitute for formal education. This could explain why there is no conclusive evidence in my research that children in heavily recruited communities became more literate – the improvements appear to be driven by men of military age. Yet, NGOs and researchers have found that adult literacy is notoriously hard to improve even today. Military training still constitutes one of the most important areas of international cooperation. And, contexts of underinvestment in human capital have not lost their relevance either in the 21st century: analysts estimated in 2008 that that more than 80% of the Afghan army recruits were illiterate. In such environments, Punjab’s WWI experience could point at unintended benefits of military service and international cooperation cooperation for illiterate recruits. Still, writing just a few days before Armistice, it seems fitting to emphasise that Punjab’s human capital accumulation after the war came at a terrible cost: for every six additional literate men, one Punjabi soldier gave his life. This article is based on the Working Paper “Military Service and Human Capital Accumulation: Evidence from Colonial Punjab” which can be viewed here. Oliver Vanden Eynde is Assistant Professor at the Paris School of Economics. He completed his PhD in Economics at LSE in 2012.